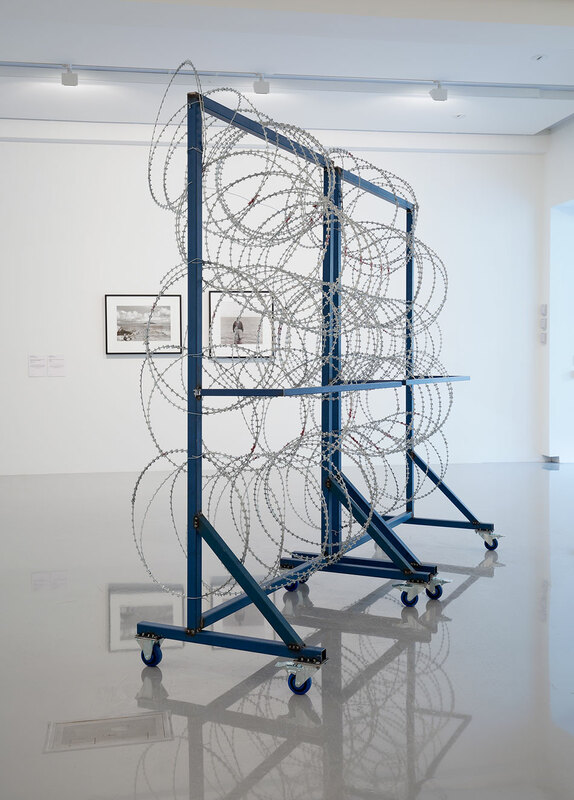 The Least of the Doorkeepers (It is Possible but Not at the Moment) is a work that consists of a pair of mobile razor wire fences that are moved around the gallery in a series of choreographic patterns, blocking and rerouting the movement of gallery visitors. The title of the work references Franz Kafka’s parable, Before The Law. The Least of the Doorkeepers was commissioned for the exhibition Borders, Barriers, Walls, curated by Francis E. Parker at the Monash University Museum of Art. During the Borders, Barriers, Walls opening event, a pair of uniformed guards moved the fences around the gallery, variously interrupting, inhibiting and redirecting the passage of viewers through the museum. If asked about their activities the guards gave evasive answers aimed at deferring people’s progress and frustrating the enquirer. The fences continued to be re-positioned by MUMA gallery staff for the duration of the exhibition. Seen from a slightly different angle, as responses to contested and eroding state sovereignty, the new walls project an image of sovereign jurisdictional power and an aura of the bounded and secure nation that are at the same time undercut by their existence and also by their functional inefficacy. Notwithstanding their strikingly physicalist and obdurate dimensions, the new walls often function theatrically, projecting power and efficaciousness that they do not and cannot actually exercise and that they also performatively contradict. To literalize walls as pure interdiction occludes their production of an imago of sovereign state power in the face of its undoing, and it occludes the walls’ consecration of the corruption, contestation, or violation of the borders they would fortify. It also misses their staging of sovereign powers of protection, powers radically limited by modern technologies and paths of infiltration and by the dependence of various “national economies” on much of what walls purport to lock out, especially cheap labor. It misses, in short, the Wizard of Oz quality in the new walls, the way they echo coded (yellow/orange/red) security threat levels that stage an image of state intelligence and control in the face of the opposite. Reviewer Robert Nelson describes the fences as malicious parapets that “almost literally catch your eye with sublime terror“.